According to his first steady girlfriend, Dot Rhone, Love Of The Loved was written for her by McCartney at some point towards the end of 1959. McCartney himself has not publicly stated if the song was written with any particular person in mind, although he does remember coming up with it late one night, playing his Zenith guitar as he walked home. It was the twelfth song recorded by The Beatles at their audition for Decca Records. It was later recorded by Cilla Black on Wednesday 28 August 1963, produced by George Martin. It was released as her debut single (Parlophone R5065) on Friday 27 September 1963. 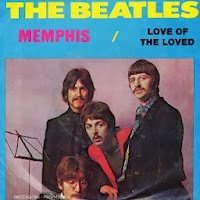 It entered the UK singles chart on Thursday 17 October 1963, spending 6 weeks on the chart and peaking at number 35. I'd heard the song many times in the Cavern and I was ever so disappointed when I got into the studio and heard this jazzy brass sound. The song does not appear on Anthology 1, having been vetoed by McCartney for unknown reasons. It had featured in The Beatles' live act between 1960 and 1962, but did not become a regular feature of their act until December 1961, only a month before the Decca Audition, and even then, they only played it to their loyal audience at the Cavern. They had had reservations about including any original material in their act, and it was only at the insistence of Brian Epstein that they dug out this and a few other Lennon-McCartney originals - notably Hello Little Girl (Lennon's, from 1957) and Like Dreamers Do (McCartney's, from 1959). Epstein felt that including their own material would set them apart from the myriad of other bands all hoping to make the Big Time by bashing out the same American hits. Tune In: The Beatles: All These Years Mark Lewisohn - p246 note ? Tune In: The Beatles: All These Years Mark Lewisohn - p217 ? 45 Cat: Love Of The Loved ? jpgr.co.uk: Love Of The Loved ? The Complete Beatles Chronicle Mark Lewisohn - p363 ? Tune In: The Beatles: All These Years Mark Lewisohn - p533 ?